The Indoor/Outdoor and Heavy Duty range of mirrors include a steel wall mounting J-Bracket. 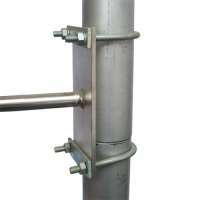 The Pole Mounting U-Bolt Pack is used for securing the J-Bracket to a 3" diameter pole. This hardware pack is made from solid steel and zinc coated for long term durability. This U-Bolt Pack includes u-bolts, hardware and mounting plates (pole not included). Not required for DeLuxe Traffic or Pro Series Traffic models which already include a 3" Pole Clamp bracket. The Indoor/Outdoor and Heavy Duty range of mirrors include a steel wall mounting J-Bracket. The Pole..